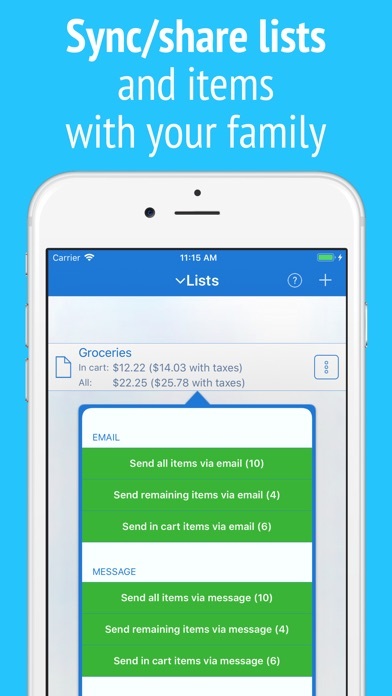 The best and easiest shopping list on the App Store, WITHOUT monthly subscriptions, WITHOUT recurring fees and WITHOUT advertisements. If you want (and it isn't mandatory), you can unlock advanced features with a single one-time in-app purchase. WHY CHOOSE INTELLILIST? 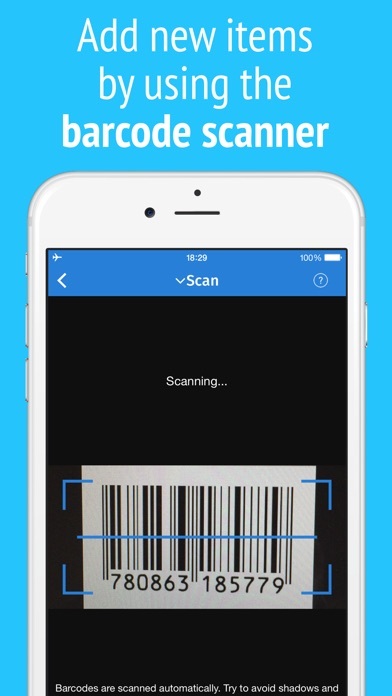 ● Browse hundreds of preloaded items, scan a barcode or insert your own items. ● Add a photo to your items and never be confused about what to buy. 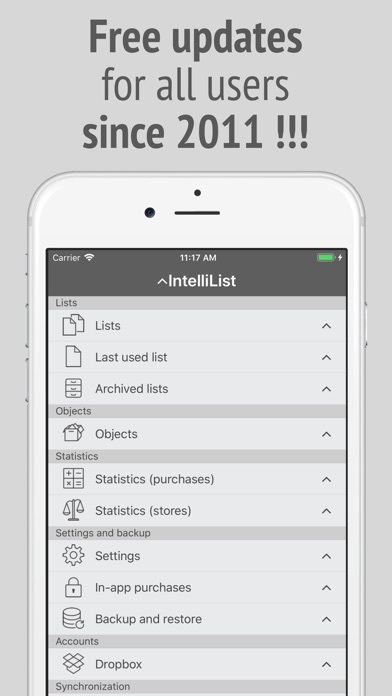 ● Reuse archived lists, add items to your favorites and browse your purchase history. ● Organize items in aisles, and change aisles order to suit your local store. 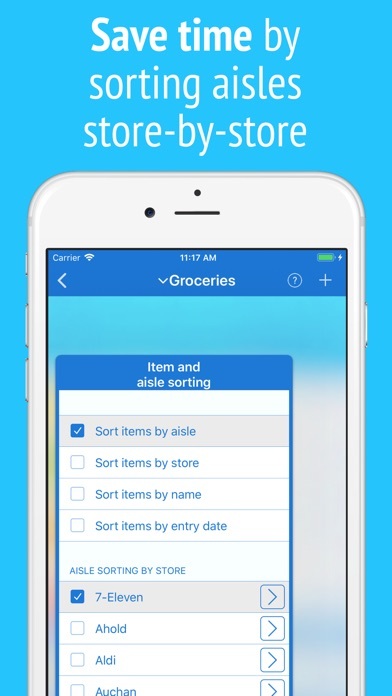 You can sort aisles store-by-store. ● Archive your lists to reuse them and to see statistics about your purchases (for example you can identify cheaper and most expensive stores, overall and grouped by aisles). ● For each item you can save all the prices you want and compare prices of various stores. ● Insert the package size, see the price per unit and easily compare item packs. 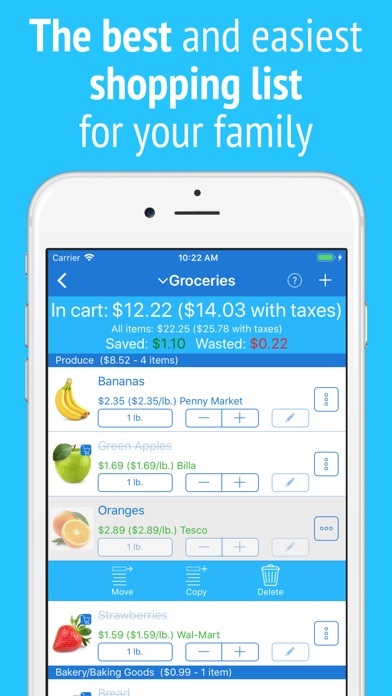 ● See how much money you can save or waste for each list. ● Identify on the fly items you're paying too much thanks to color pricing. ● Share and synchronize your lists on multiple devices by enabling the Dropbox sync. Or send your lists via email, WhatsApp, SMS or iMessage. 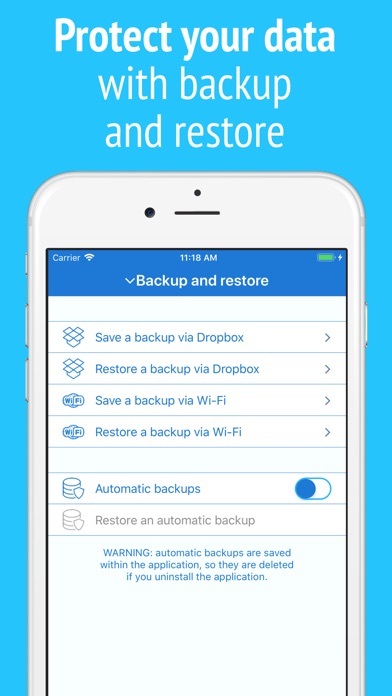 ● Backup your data to avoid data loss. ● Customize IntelliList by choosing among 22 color templates, 22 different icons and 20 fonts. 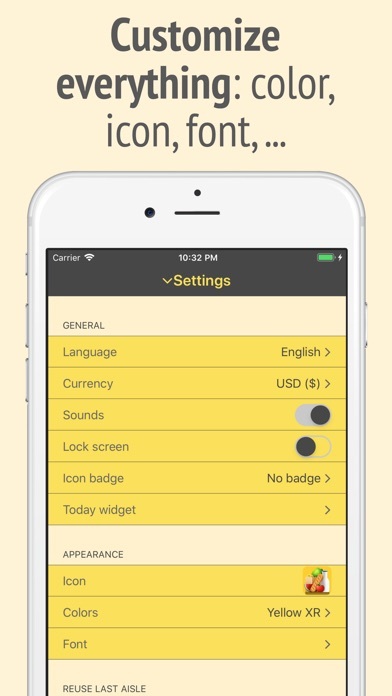 ● Use IntelliList on all your devices (iPhone, iPad and iPod Touch): it’s an universal app. 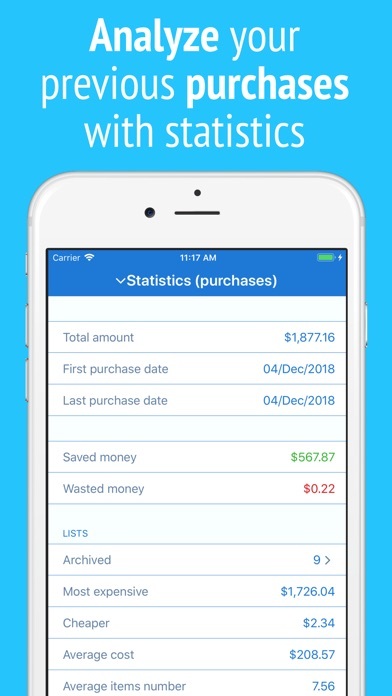 USERS AND BLOGGERS SAY NICE THINGS ABOUT INTELLILIST ● 'Thanks to saved money I have already recovered the app cost' ∗∗∗∗∗ ● 'I have been trying different apps to find a great shopping list, and now I've found it' ∗∗∗∗∗ ● 'IntelliList is an uncluttered, well-organized shopping list that is surprisingly easy to navigate and use' (AppAdvice.com) ∗∗∗∗∗ ● 'I don't see myself without this app' ∗∗∗∗∗ IN-APP PURCHASE The base version lets you create or customize up to 30 items. To create or customize an unlimited number of items you can upgrade to the full version (with a one time in-app purchase). NOTE The matching between barcodes/photos and items is managed in a social way, through the community of IntelliList users. Inevitably, in the beginning only few barcodes/photo will be recognized. But the more people use IntelliList, the better IntelliList will get. SUPPORT If you have problems or suggestions please contact us via support@ameridea.com (you can do this from within the app itself). We are not able to help you if you simply leave a comment on the App Store. We give the greatest importance to the quality and reliability of the application, and we will be happy to solve any problem. 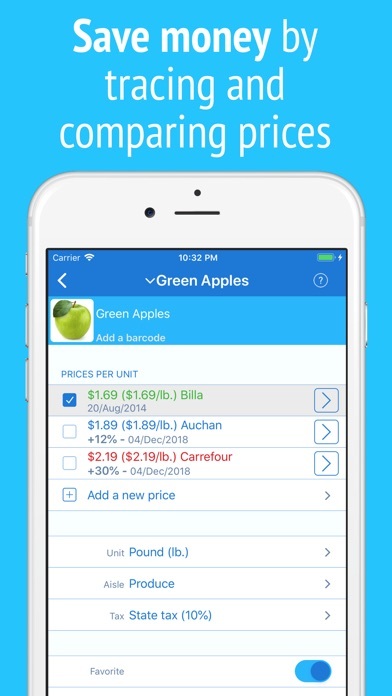 The best shopping-list app I’ve used to date! The ability to share with other apps besides WhatsApp would nice though. Just got this so I don’t know of the reliability but it’s a nice app. Gives a running price total as you go. Some choices of list view etc. you can try the free version with 30 entries. Hoy bajé la aplicación y aún estoy conociendo qué puedo lograr y hasta el momento es fácil de usar. Una lástima que a los nuevos usuarios tengamos que pagar para añadir más de 30 artículos pero hasta ahora la lista original es bastante amplia y entiendo que cobren, veré también si necesite hacerlo. Puse 5 estrellas porque es muy temprano para encontrar algo negativo. Cuando ya explore un poco más podré dar una opinión más certera de lo que aprenda. Lo que puedo decir desde ya es q es bastante completa, muy útil y muy vistosa (la encuentro muy linda). Gracias por el esfuerzo, aquí mi comentario y la calificación. Hasta pronto. I like your app and would trade in the one I yes now but your app doesn’t have enough character space for my city’s sales tax which is .0825%. I loved this app after first installing it. But then a few weeks in to using it I could no longer add or customize items unless I paid $4.99 a month. They falsely advertise in the app description that there are “NO MONTHLY SUBSCRIPTIONS” ha! NOT TRUE PEOPLE!!!! I will be uninstalling this app and looking for another. Great app! Easy to use and very helpful! Good job! Finally a grocery list that works with budgeting! I have used several shopping list apps but even if they let you put in an item’s price, they don’t store that price for the next shopping trip. So they’re really useless if you need to stay within a certain amount per trip. Thank you for making that work. I also like that you can have lists for different stores and can run reports to see where you can save. The only thing I would ask would be the ability to arrange aisles the way you want so you can work through the list as you progress through the store. Less scrolling. Also, it would be great if you could minimize aisles so you would could concentrate on the aisle you’re in. 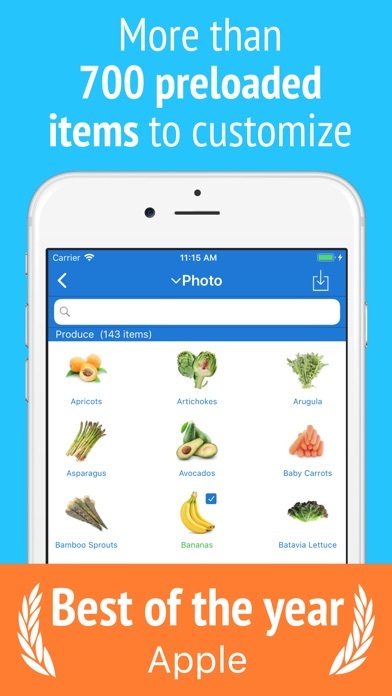 Thanks to the latest upgrade users can now sort aisles by store. This app is now definitely worth five stars! Thank you for listening to those of us who begged for this feature!